You can create ambiance and set the perfect mood with your lighting control – but your system can also help lower your energy usage. Install photo sensors so that during the day, depending on the hour, they’ll detect whether the sun is shining in too intensely or not. Your lights will then know to brighten or dim, according to the natural lighting at the moment. At the end of the day, you can push one button to turn off every single light in your home so that none get left on overnight. You can also set up motion detectors in your rooms so that when the last person has left a certain space, the lights will automatically turn off after a set amount of time. You won’t have lights on that go unused, and you won’t have to worry if you’ve forgotten you’ve left some on ever again! 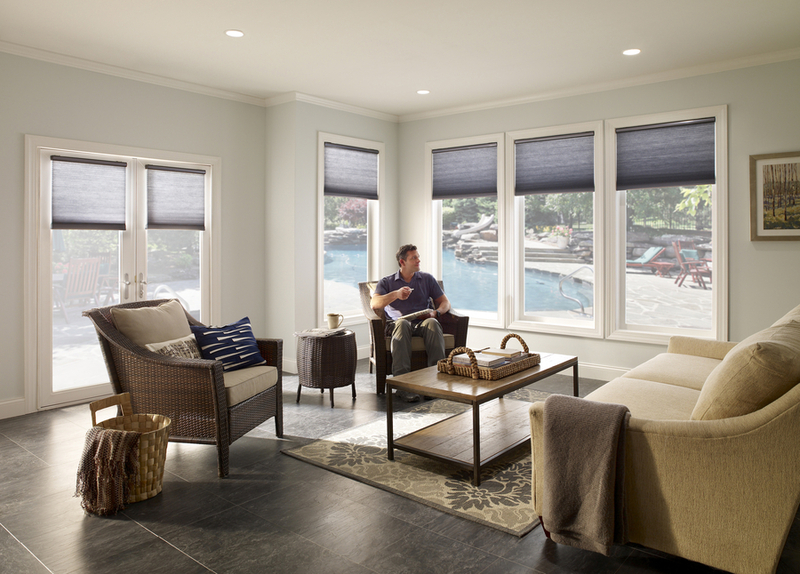 There are endless styles and patterns to choose from for your motorized shades – but did you know your window treatments can also provide insulation for both the warm and cold weather? When your shades are installed, there will be a small gap between the shade itself and the window – creating a pocket of insulation that will help keep your home heated or cooled, giving your HVAC system a break. Honeycomb shades are specifically designed for this too, and can help with your home’s temperature even more so. With those photo sensors we mentioned above, your shades can also respond to the sun’s harsh rays piercing through your windows. They’ll lower themselves and help to prevent solar heat gain in your home. With a smart thermostat, you can easily control your home’s temperature manually or automatically. Use a smart device or touchscreen remotely to change the temperature, monitor your thermostat, or even to check if you’ve left the AC or heat on too high. You can then adjust everything accordingly, so no energy is wasted while you’re away from home. Don’t let the idea of new smart tech in your house keep you from maintaining your home energy management. Now the two can blend together! Want to learn more about how you can save energy with smart home features? Give us a call or fill out our contact form to schedule a no-obligation consultation with our team. We’d love to hear from you!